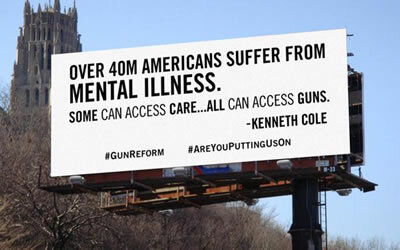 Kenneth Cole got one thing right with his recent billboard, placed over a busy Manhattan highway: we need to provide better access to mental health care for everyone. But to associate the mentally ill with violence and to continue to exacerbate the stigma surrounding those with mental illness? Shame on you, Kenneth Cole. As the director of marketing and public relations for one of the largest private mental health programs in the nation, each day I fight against the stigma that is perpetuated by messages like this, in order to help those with mental illness get the help they need, sooner rather than later. My goal is to educate, so that hopefully one day very soon, people will understand that if someone is suffering from mental illness, it does not mean they are inherently violent (according to mentalhealth.gov, only 3-5% of violent acts can be attributed to those with mental illness). In fact, studies show that those with mental illness are more likely to be the victims of the crime than the perpetrators. I understand that some of the stigma, which tends to escalate when a horrible, violent act occurs, stems from fear and a need to understand why. But to put general blame on those with mental illness is not the answer; in fact, it likely deters those who need help from getting it. Our society has spent so much time alienating groups of people, whether based on race, religion, sexual preference, or anything else we can find that makes someone or their choices different. Why can’t now be the time that we learn our lesson, and support people that are different or need help, rather than alienate them? With nearly 1 in 5 Americans suffering from mental illness, it is a disease, like heart disease, cancer, or any other disease, that affects us all. So let’s work together to help people get the treatment they need and #givestigmatheboot. That includes you, Mr. Cole. It’s time to take your billboard down. Jessica Kapustin is the director of marketing and public relations at Sheppard Pratt Health System.